I am a rice freak. Its a staple food in all my meals. Guess i have inherited this genetically from my parents. Our family meals are incomplete if there is no chawal-dal (rice & curry). And then there are days when my husband and i both prefer to have some rice preparation for dinner specifically. Quicker, as its done in a matter of few whistles and tastier coz it calls for plenty of condiments along with it, that are easily available in every household! 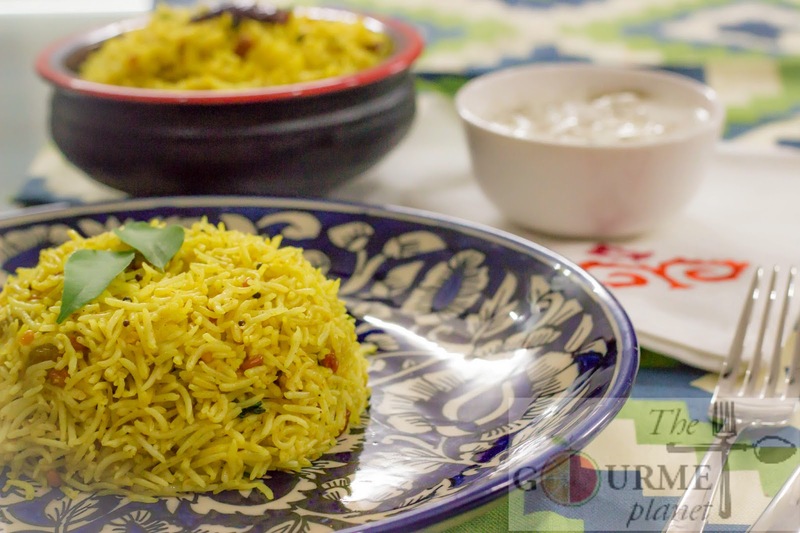 With rice preparations all you need is some salad, pickle and poppadom for some crunchy munchy taste and once all is set, there can be no match to this divine combination. Oooo! Waah! Kya baat..i am drooling on the thought itself. I think this defines my love for it, honestly. I have mastered the various well-known rice combos (a statement from my hubby dear) of northern part of India, kadhi-rice, rajma-rice or chole-rice. All tried and tasted plenty of times. 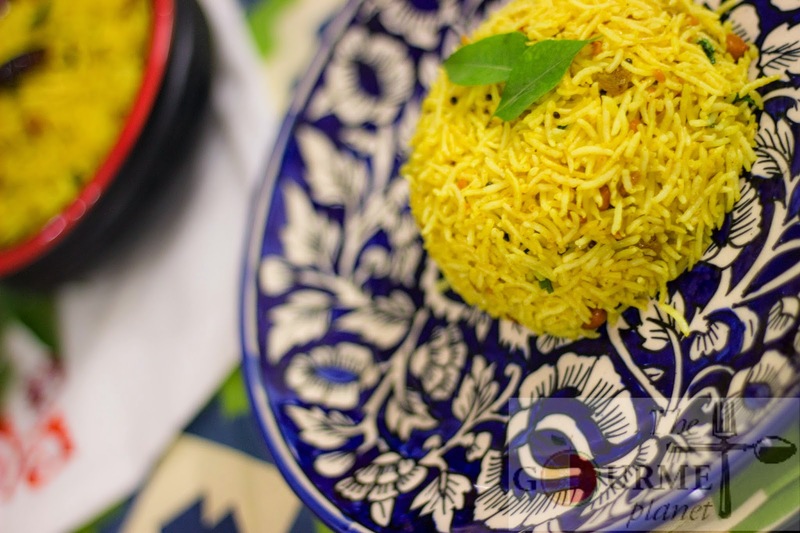 So today i attempted a southern flavor of rice in my North Indian kitchen, & guess what! I conquered it!!! My husband who is not a great rice lover happily finished more than half of it!!!! Whaoo! The feeling is amazing..I guess more than ingredients of the recipe what matters the most is the love that you put in the food you cook. I love my kitchen and all that i cook there with so much care. Today i celebrated the feeling of love for my love of cooking and of course the love for rice with my one hot pot meal recipe of lemon rice with some pickled onion curd (recipe shared in the end) to enhance the sourness further. Its super duper easy and i have, as always, made a slight twist to it. Old habits die hard! 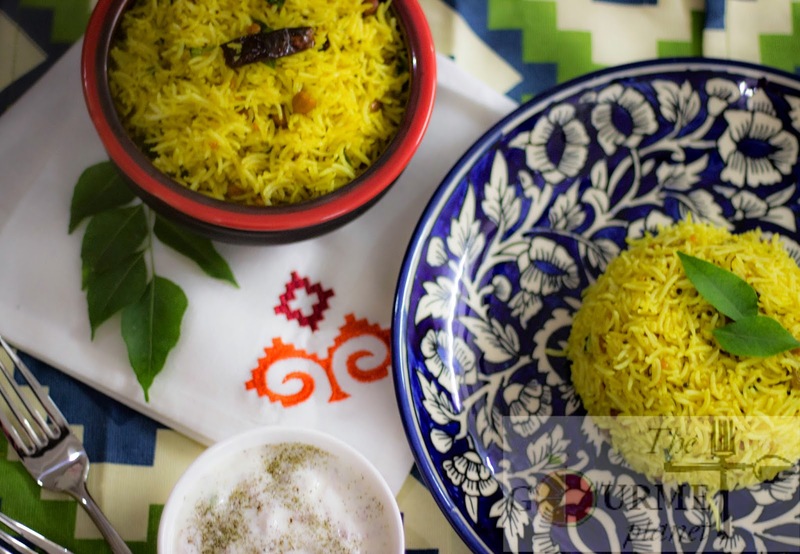 So here's a super quick twisted lemon rice..completely my way. Raisins to balance the sourness from lemons n pickled curd. Trust this twist was worth it. 1. Soak the rice in water for an hour or two. 2. Once soaked completely, boil the rice with minimum water (uptil the level of dipped rice or 1/2 inch above) upto 1-2 whistle and then turn off the heat. NOTE: Do not cook it for more whistles else the rice grains will stick to each other and will not be flaky. 3. Once the rice is cooked, transfer it to a broad plate and let it cook. Give it good swirl, ensuring that rice grains are not sticky. 4. Heat a wok and pour in the oil. 6. Once the dals emanate their aroma, they are roasted well at that point. 7. Simmer the gas and add curry leaves, mustard seeds, asafoetida, dried red chillies. Toss for a minute or two. 8. Add haldi, coriander powder, salt and sambar masala and raisins. Swirl the pan well so that everything gets mixed well. 9. Add the rice and vigorously toss the contents. The rice should after thorough tossing should become yellow in color. 10. Lid for 3-4 minutes. 11. Unlid the pan, toss one more time and turn off the gas. 12. Add the lemon juice and toss for some more time. NOTE: Lemon juice should be added only once the gas is turned off. 13. Sprinkle some coriander and serve with appalams and pickled onion curd. Pickled Onion Curd: Finely chop some onions and green chillies and squeeze in good amount of lemon juice so that the onions and green chillies are completely soaked in the juice. Refrigerate this for 3-4 hours. Meantime, whisk some curd and add black salt, powdered roasted cumin and some freshly ground (in mortar & pestle) mint leaves. After 3-4 hrs or whenever the dinner is to be served, add the onion-green chilli pickled mixture to the whisked curd. Serve chilled along with lemon rice or any other dish. Enjoy this dish with your loved ones on of those laid back days when you just feel like relaxing and treating yourself with some comfort food.